In the original Spanish dish, saffron is used to give the rice its characteristic hue, but because it wasn’t available in the New World, achiote was substituted for the saffron as the dish made its way across the Atlantic. While achiote has a similar golden hue, it’s almost flavorless and doesn’t contribute much to the rice. 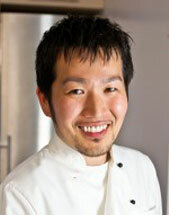 That’s why I like to take the dish back to its roots and use a blend of saffron and turmeric. 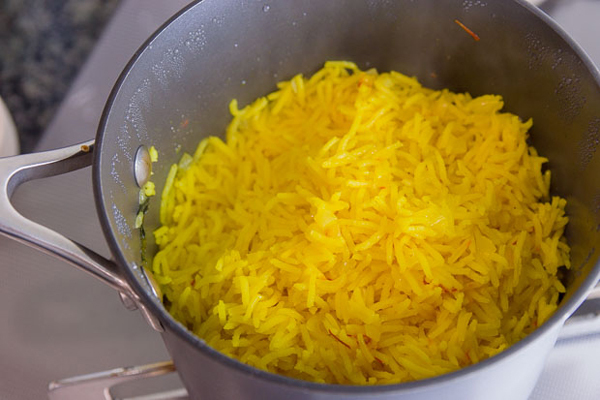 The combination yields a ridiculously vibrant yellow, while both spices contribute their own unique flavors to the rice. 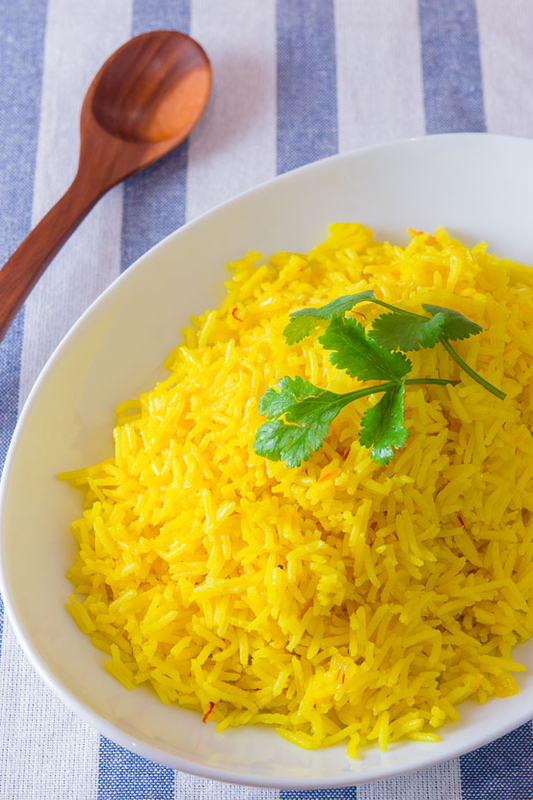 Turmeric gives the rice an earthy flavor with hints of warm spices like ginger, while the saffron imbues a sweet floral taste with a savory aroma vaguely reminiscent of shellfish. Aside from the spices, some good chicken stock and onions are all you need to make this stunning side that tastes as good as it looks. Because yellow rice is usually served as an accompaniment to another dish, like picadillo, I don’t add any salt (beyond what’s already in the chicken stock). If you plan on eating this by itself, you may want to season it with some salt. 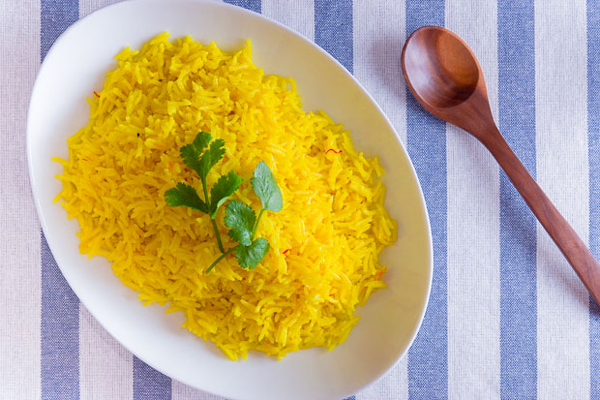 This yellow rice uses turmeric and saffron for its vibrant color and flavorful taste. Add the saffron and turmeric to the chicken stock, stir, and let it sit while you chop and sauté the onions. In a heavy bottomed pot, add the oil and onions and sauté over medium-high heat until the onions start to brown around the edges. Add the rice, and stir to coat evenly with the oil. Add the chicken stock, and bring to a boil. Turn down the heat and cover the pot, adjusting the heat as needed to maintain a gentle simmer. Set the timer for 15 minutes. 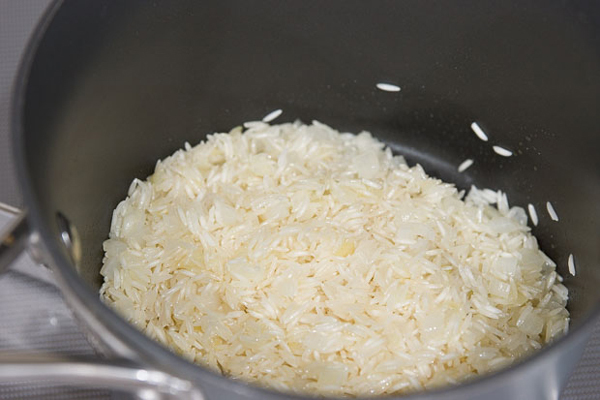 When the rice is cooked, turn off the heat but do not remove the lid. Let the rice steam for another 10 minutes. Remove the lid, fluff the rice and serve.